4400601 L504 LIEBHERR L504 wheel loader Spare Parts Catalog. Service Manual and additional technical information for repair and operating. 4400602 L506 LIEBHERR L506 wheel loader Spare Parts Catalog. Service Manual and additional technical information for repair and operating. 4400603 L508 LIEBHERR L508 wheel loader Spare Parts Catalog. Service Manual and additional technical information for repair and operating. 4400604 L510 LIEBHERR L510 wheel loader Spare Parts Catalog. Service Manual and additional technical information for repair and operating. 4400605 L511 LIEBHERR L511 wheel loader Spare Parts Catalog. Service Manual and additional technical information for repair and operating. 4400606 L512 LIEBHERR L512 wheel loader Spare Parts Catalog. Service Manual and additional technical information for repair and operating. 4400607 L521 LIEBHERR L521 wheel loader Spare Parts Catalog. Service Manual and additional technical information for repair and operating. 4400608 L522 LIEBHERR L522 wheel loader Spare Parts Catalog. Service Manual and additional technical information for repair and operating. 4400609 L524 LIEBHERR L524 wheel loader Spare Parts Catalog. Service Manual and additional technical information for repair and operating. Operating and Maintenance Manual. 4400610 L531 LIEBHERR L531 wheel loader Spare Parts Catalog. Service Manual and additional technical information for repair and operating. 4400611 L534 LIEBHERR L534 wheel loader Spare Parts Catalog. Service Manual and additional technical information for repair and operating. Operating and Maintenance Manual. 4400612 L538 LIEBHERR L538 wheel loader Spare Parts Catalog. Service Manual and additional technical information for repair and operating. 4400613 L541 LIEBHERR L541 wheel loader Spare Parts Catalog. Service Manual and additional technical information for repair and operating. 4400614 L551 LIEBHERR L551 wheel loader Spare Parts Catalog. Service Manual and additional technical information for repair and operating. 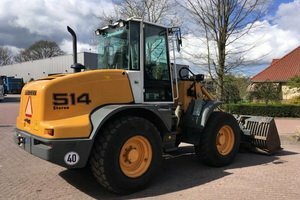 4400615 L544 ZF LIEBHERR L544 ZF wheel loader Service Manual and additional technical information for repair and operating. 4400616 L544 ZF LIEBHERR L544 ZF wheel loader Service Manual and additional technical information for repair and operating. 4400617 L564 ZF LIEBHERR L564 ZF wheel loader Service Manual and additional technical information for repair and operating. 4400618 L574 ZF LIEBHERR L574 ZF wheel loader Service Manual and additional technical information for repair and operating. 4400620 L506 Stereo LIEBHERR L506 Stereo Wheel Loader Spare parts catalog. Operation and maintenance Manual. Service Manual and additional technical information for repair and operating. 4400621 L507 Stereo LIEBHERR L507 Stereo Wheel Loader Spare parts catalog. Operation and maintenance Manual. Service Manual and additional technical information for repair and operating. 4400622 L507S Stereo LIEBHERR L507S Stereo Wheel Loader Spare parts catalog. Operation and maintenance Manual. Service Manual and additional technical information for repair and operating. 4400623 L508 Stereo LIEBHERR L508 Stereo Wheel Loader Spare parts catalog. Operation and maintenance Manual. Service Manual and additional technical information for repair and operating. 4400624 L509 Stereo LIEBHERR L509 Stereo Wheel Loader Spare parts catalog. Operation and maintenance Manual. Service Manual and additional technical information for repair and operating. 4400625 L509S Stereo LIEBHERR L509S Stereo Wheel Loader Spare parts catalog. Operation and maintenance Manual. Service Manual and additional technical information for repair and operating. 4400626 L510 Stereo LIEBHERR L510 Stereo Wheel Loader Spare parts catalog. Operation and maintenance Manual. Service Manual and additional technical information for repair and operating. 4400627 L512 Stereo LIEBHERR L512 Stereo Wheel Loader Spare parts catalog. Operation and maintenance Manual. Service Manual and additional technical information for repair and operating. 4400628 L514 Stereo LIEBHERR L514 Stereo Wheel Loader Spare parts catalog. Operation and maintenance Manual. Service Manual and additional technical information for repair and operating. 4400629 L506 Stereo Tier 3A LIEBHERR L506 Stereo Tier 3A Wheel Loader Spare parts catalog. Operation and maintenance Manual. Service Manual and additional technical information for repair and operating. 4400630 L507 Stereo Tier 3A LIEBHERR L507 Stereo Tier 3A Wheel Loader Spare parts catalog. Operation and maintenance Manual. Service Manual and additional technical information for repair and operating. 4400631 L507S Stereo Tier 3A LIEBHERR L507S Stereo Tier 3A Wheel Loader Spare parts catalog. Operation and maintenance Manual. Service Manual and additional technical information for repair and operating. 4400632 L508 Stereo Tier 3A LIEBHERR L508 Stereo Tier 3A Wheel Loader Spare parts catalog. Operation and maintenance Manual. Service Manual and additional technical information for repair and operating. 4400633 L509 Stereo Tier 3A LIEBHERR L509 Stereo Tier 3A Wheel Loader Spare parts catalog. Operation and maintenance Manual. Service Manual and additional technical information for repair and operating. 4400634 L509S Stereo Tier 3A LIEBHERR L509S Stereo Tier 3A Wheel Loader Spare parts catalog. Operation and maintenance Manual. Service Manual and additional technical information for repair and operating. 4400635 L510 Stereo Tier 3A LIEBHERR L510 Stereo Tier 3A Wheel Loader Spare parts catalog. Operation and maintenance Manual. Service Manual and additional technical information for repair and operating. 4400636 L514 Stereo Tier 3A LIEBHERR L514 Stereo Tier 3A Wheel Loader Spare parts catalog. Operation and maintenance Manual. Service Manual and additional technical information for repair and operating.